To what degree are you embracing your channel partners and making them engaged and happy throughout the process? Recognize that you don’t have the type of control over partners as you do in your own organization. This is the make or break understanding that is core to channel engagement: always remember that partners are independent and have their own agendas. So, how can you build individual relationships with the dealer’s sales team or other employees? 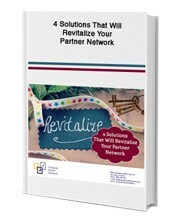 Fill out the form on the right to download your free copy of “4 Solutions That Will Revitalize Your Partner Network”.